Nandakumar Ravi, M.D., a gastroenterologist in Bakersfield, California, is dedicated to providing state-of-the-art diagnosis and treatment of conditions affecting the gastrointestinal tract. We treat each patient as a partner and make patient education a central component of medical care. Sensitivity and discretion are used in handling all of our patients' concerns. We have upgraded our facilities! 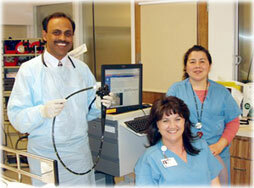 Our new office at 9870 Brimhall Road, Suite 100 in Bakersfield, CA, includes an on-site endoscopy center. More information and about our improvements is coming soon. We hope you find this website helpful in your health care decisions. Please contact us with questions or for an appointment.